Home > リスニング > ♪Congratulations! – おめでとう! Just about a week ago, the whole nation was jubilant over Naomi Osaka’s victory at the Australian Open. That’s her second consecutive Grand Slam title and she is now ranked number one in the world. I’m sure she got a lot of congratulations from friends and family and fans around the globe. 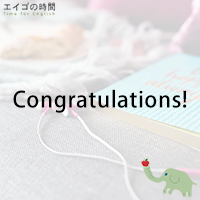 So, let’s take this opportunity and note that the word “congratulation” is used in the plural, or “congratulations”, when telling someone that you’re pleased about their success, good luck or happiness, such as someone getting married or engaged, passing an exam, or winning the lottery. For example, your friend says, “Hey, I passed my driving test!” You can say, “Great! Congratulations!” “I got the job!” “Oh you did? Congratulations!” “I’m getting married!” “How wonderful! Congratulations!”. So, when you congratulate someone, don’t be stingy. Give them many congratulations.